Astronomers study the universe from nearby planets to the most distant galaxies. In doing so, they attempt to answer some of the most exciting and challenging questions we can think of. Are we alone? How did the Universe come into being? How are stars born, and how do they live and die? How did our Solar system form? Is the Earth unusual? To answer these questions, and many more, astronomers play the role of detectives. Astronomers make observations, using telescopes scattered around the planet, or launched into space, to uncover clues that might help them better understand the Universe. To explain the observations, astronomers build theories describing how things work. Those theories have to explain everything they observe, but also must make predictions. Astronomers often travel the world, visiting telescopes that are located in dark, remote sites (including the Atacama Desert, the Canary Islands, and Hawaii). The analysis of their observations is done by computer, so both theorists and observers spend large amounts of their time working with computers, writing computer code and studying the output. We also, like all scientists, spend lots of time writing and talking about our work, making presentations at conferences and writing papers to report our findings to the rest of the astronomical community. I do most of my research in three strongly linked fields. I study our Solar system, with a particular interest in the small objects like comets and asteroids that are left behind from the formation of the planets. 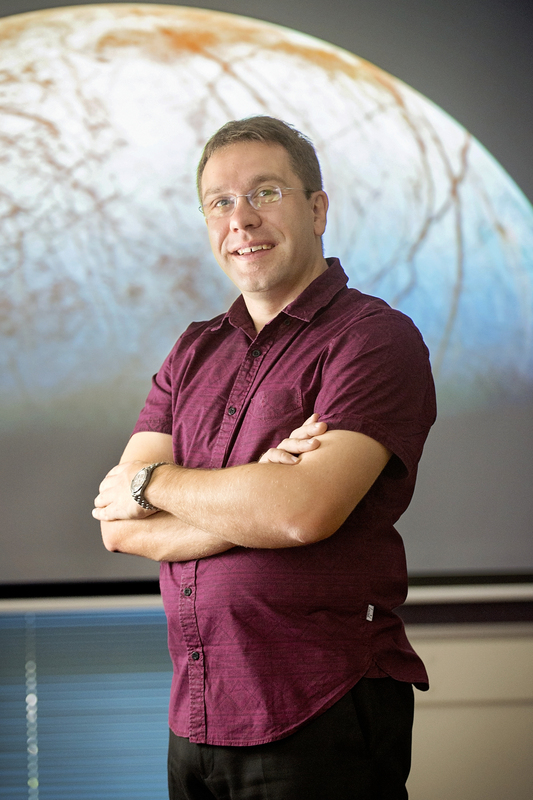 I also study other planetary systems – exoplanets – helping colleagues to search for new worlds around other stars, and to learn more about any planets we do find. I’m also involved with Astrobiology research, trying to work out what would make one planet a more suitable location for life to develop and thrive than another. The goal of those studies is to lay the groundwork for the search for life beyond the Solar system, to ensure that when we do find truly Earth-like planets around other stars, that we are well placed to choose the most promising targets to target in the search for life. My specialty is the study of the orbits of the objects we find. I use a piece of software called MERCURY, which is essentially a clockwork universe program. With that tool, I run huge simulations on supercomputing clusters across Australia, which take millions of CPU hours to tell us more about the nature of other planetary systems, or about the origin of the small objects in our own Solar system. Using that tool, I have shown that a number of previously proposed planetary systems around other stars make no sense, revealing that there must be another cause for the observed unusual behaviour of the stars in question. I have overturned the myth that the giant planet Jupiter has played a pivotal role in protecting the Earth from impacts, helping to ensure our planet is suitable for life to develop and thrive. In contrast, I found that Jupiter is at least as much of a threat to life on Earth as it is our saviour, without Jupiter, far few objects would be flung towards our planet to imperil life in the first place! I first became interested in Astronomy at the age of five when I accidentally saw the end of a TV program in the UK called ‘The Sky at Night’. I was immediately hooked! I joined my local astronomical society when I was just eight years old and have been a keen amateur astronomer ever since. I got my first telescope when I was very young (although in the end had to sell it when a new industrial estate was built behind my house, the lights washing out all but the very brightest stars), and have always loved laying out under the stars on a dark moonless night, watching for meteors. At school, I made sure that I studied physics and maths, the two most important subjects for a budding astronomer. I then went to study at Durham University, where I did a four year undergraduate Masters’ degree in Physics and Astronomy. Once I finished my studies at Durham, I accepted a position at Oxford University, to study for my D.Phil. (a Ph.D., by another name). I spent three years studying there before submitting a thesis entitled ‘The Behaviour of Small Objects in the Outer Solar System’. I then moved to Switzerland, and spent three years as a Post-doctoral Research Fellow at the University of Bern, before moving back to the UK to spend three years as a researcher at the Open University. After a year teaching at Durham University, I moved out to Australia in 2010, to take up a research post at the University of New South Wales. My most recent and hopefully final move came in 2014, when I accepted a position at the University of Southern Queensland, as the Vice Chancellor’s Senior Research Fellow. I have the great pleasure of being able to do my hobby as my career, I think very few people get that lucky. I particularly love communicating my science and my passion for space to the general public. I write regular articles for TheConversation, and have monthly radio spots with ABC Queensland and ABC Gippsland. I also just love research. I love trying to find new answers to questions, and to better understand how the Universe works, and our place in it. I’m probably most proud of my work studying Jupiter’s influence on the impact rate the Earth experiences. Everybody just assumed that Jupiter acted to shield us, and that planets like Jupiter were necessary for Earth-like planets to be suitable for life. To be able to study that problem and to reveal that the story is far from that simple was hugely rewarding, and really exciting! It’s also very exciting to be involved with the discovery of new planets around other stars. When I first became interested in astronomy, we didn’t know whether any other star had planets. The first planet orbiting a star like our Sun was discovered the year before I went to Uni – and while we now know of more than three thousand planets orbiting other stars, it is still thrilling to help find another new world! Follow your passion, if you have the opportunity to work in a field you love, then go for it. Ask people for advice, I know I wouldn’t have ended up at Durham if it hadn’t been for the advice and support of a young scientist who was visiting the Astronomy club I used to go to, and who was kind enough to answer my questions, and offer advice. If you don’t understand something – ask! There’s no such thing as a stupid question, in fact, the whole point of research is to find questions no-one can answer, then try to answer them yourself, working with your colleagues.